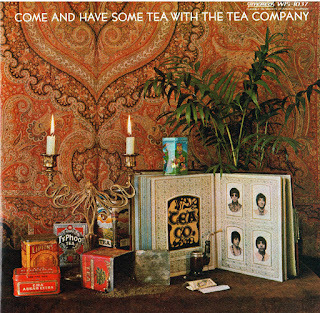 The Tea Company from New York City was one of the early birds from the US psychedelic underground scene with an LP on the market by 1968 originally released on Smash Records. This album marks the evolution of the 45 rpm teen-psych-garage band market to the upcoming LP-generation with extended improvisational parts. “The Naturals” formed in 1963 with Joe Meek influence and evolved into the Tea Company which showcased a more psychedelic sound. Opening up big ballrooms for such acts as; The Mamas and the Papas, The Lovin’ Spoonful, Bob Dylan, Ritchie Havens, and many others, the Tea Company became popular in the US underground, also in San Francisco for spectacular live shows and lyrical hippie statements. Influenced by and using the same equipment as the Beatles, the controversial and intense “East-Indo Sound” reflects “an assemblage of possessed rock performers; retinue preparing the unusual; alternating with the roots of soul…whose purpose is to cause sensation, due to stimulation of the auditory centers of the brain!” Played with lots of freaked-out-echo-organ/-guitar noises on a 12-string Rickenbacker and various-stereo madness, reminds strongly of Syd Barrett/s spirit but more driven by hard hittin/ drums. You will find an outrageous 9 min. cover version of Vanilla Fudge “You Keep Me Hangin’ On”, which is celebrated among 60s collectors as a true milestone. The album is a mindblowing and freaky production . This release (remastered) captures the end 60s stereo sound-experiments in a fresh and intense way! From New York City, The Tea Company was one of the early birds from the US psychedelic underground scene, with an LP on the market, originally released on Smash Records, in `68. This album stands for the evolution of the 45 rpm teen-psych-garage bands to the upcoming LP-generation with extended improvisational parts. Tea Company evolved from the Naturals as precursors to the psychedelic sound, with Joe Meek influences. They were founded in 1963 and played the big ballrooms supporting Mamas and the Papas, The Lovin' Spoonful, Bob Dylan, Ritchie Havens, and many others. Tea Compnay´s controversial and intense "East-Indo Sound", reflects "an assemblage of possessed rock performers; retinue preparing the unusual; alternating with the roots of soul...whose purpose is to cause sensation, due to stimulation of the auditory centers of the brain!" - They became popular in the US underground, also in San Francisco for spectacular live shows and lyrical hippie statements. The music is inspired by the Beatles, using exactly the same equipment as them. 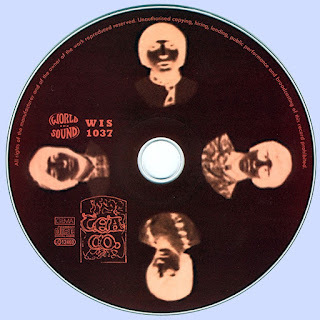 Tea Company played with lots of freaked-out-echo-organ/-guitar noises on a 12 string Rickenbacker and various stereo madness reminds strongly of Syd Barrett´s spirit but more driven by hard hittin´ drums.